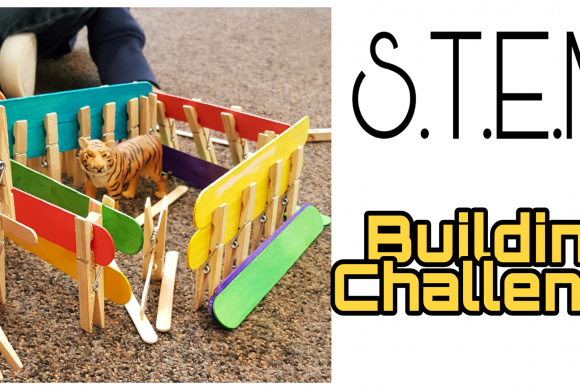 With spring just around the corner, I am excited to do some new STEM (Science Technology Engineering and Technology) activities at home, and at school with my students! 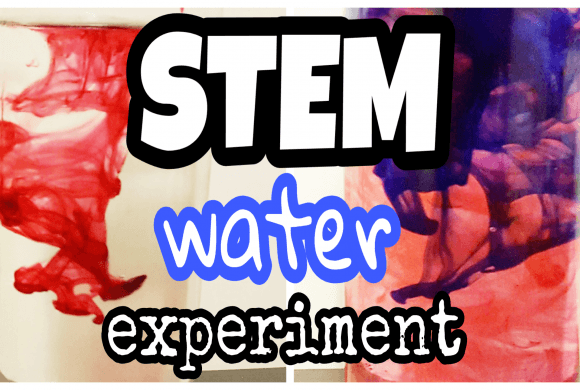 Young kids love to do science experiments, especially when they ‘explode’. 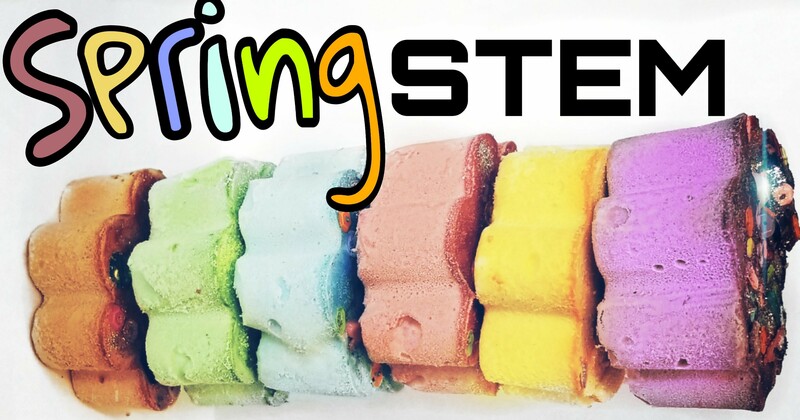 This spring STEM experiment is easy to create and made from kid friendly ingredients. 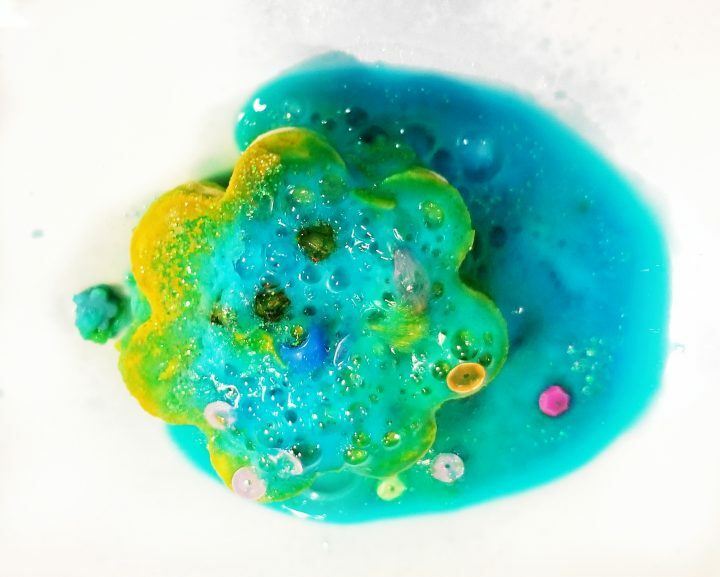 All you need is baking soda, food colouring, vinegar and a few little gems just for fun! 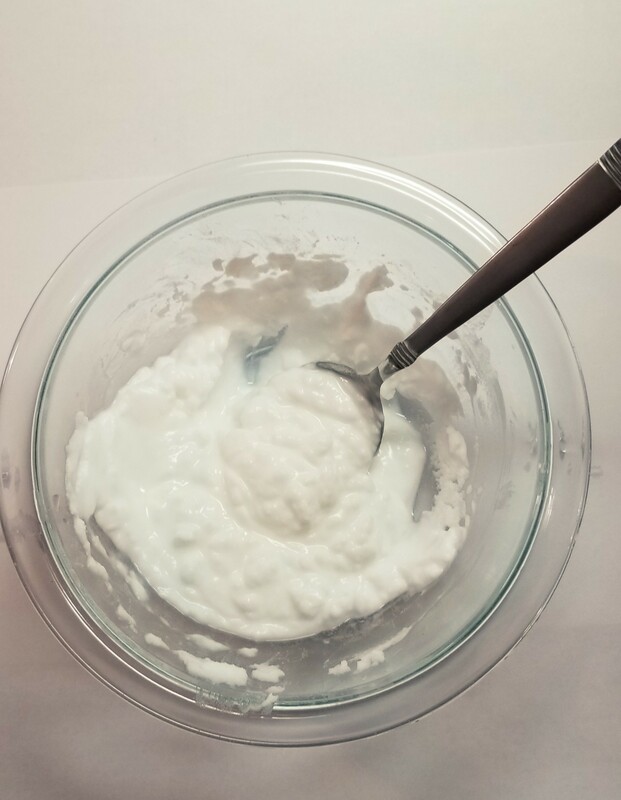 I started by mixing baking soda with water. You want the mixture to be roughly the consistency of cupcake batter. If it is wetter, it will still work it will just take longer to dry. I then add a few drops of food colouring. 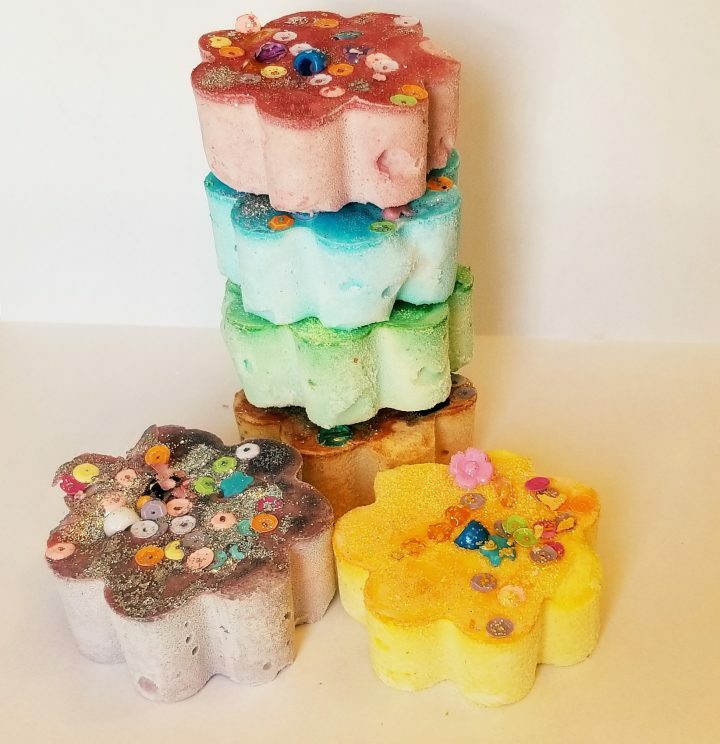 I used a variety of spring colours. Once each colour is well mixed, poured it into a silicone muffin tray to create the baking soda puck. I was able to find some flower shaped trays, which are perfect for spring, but any shape will work. 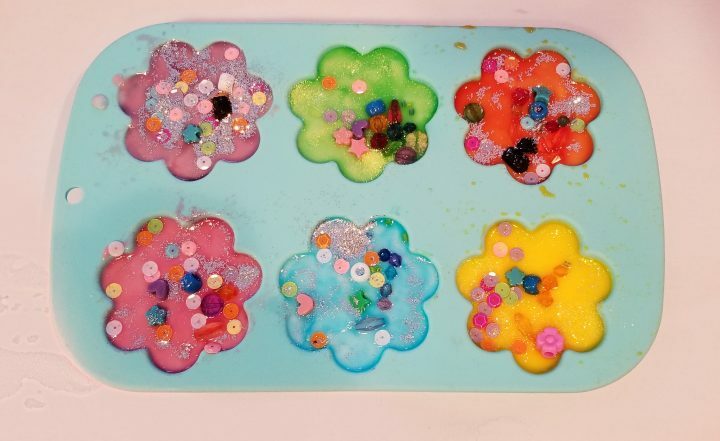 Next, I added some small gems and beads on top and pushed some into the baking soda for the kids to find as they do the experiment. Leave the pan on a flat surface to dry over night. When they are dry, they will easily pop out of the tray! I like to use eye droppers, but pipettes or medicine droppers work just as well. 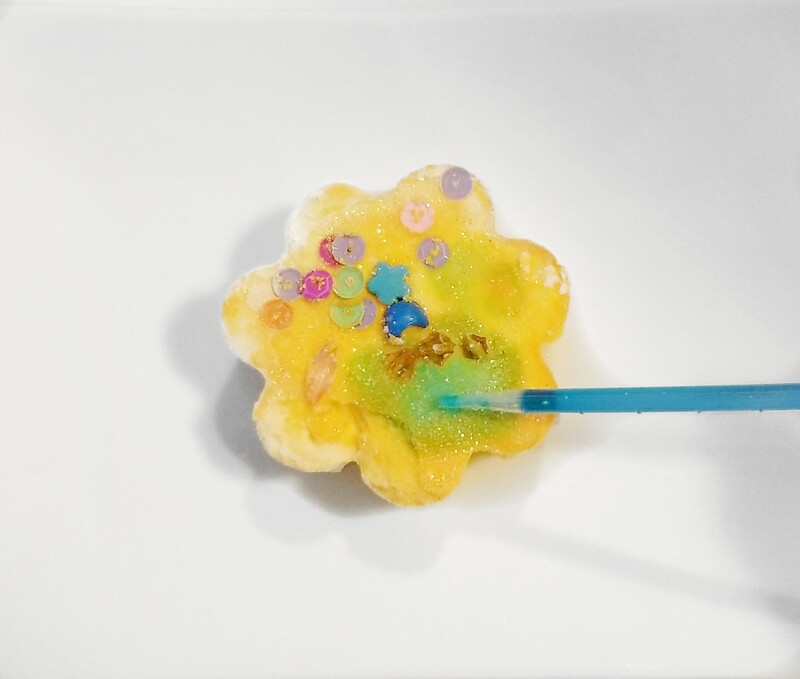 Have kids drip vinegar onto the baking soda puck and watch for the fizzy chemical reaction! Kids love to watch, and listen to the ‘explosion’ or fizzing that occurs when the vinegar touches the baking soda. As the baking soda fizzes away, the small beads are revealed from inside. The baking soda is a base and the vinegar is an acid. When an acid and a base are mixed, a chemical reaction occurs. In this case, we can see the reaction with the fizzing. To extend this activity, I like to add food colouring to the vinegar. 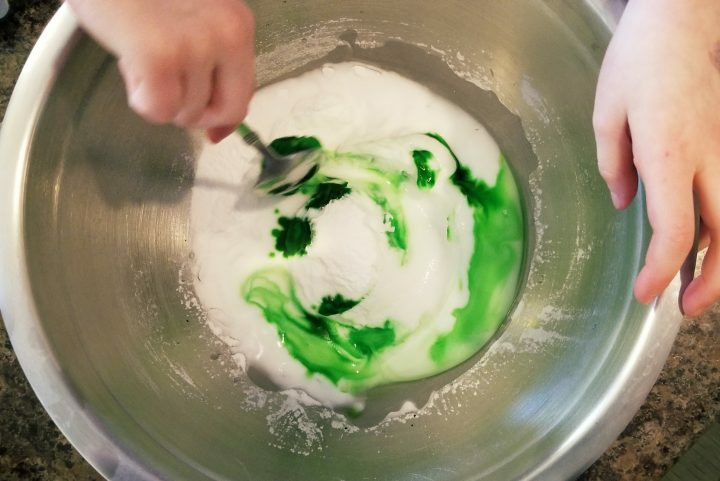 In this case, I added blue so that when the vinegar is dripped onto the yellow baking soda puck it creates green. 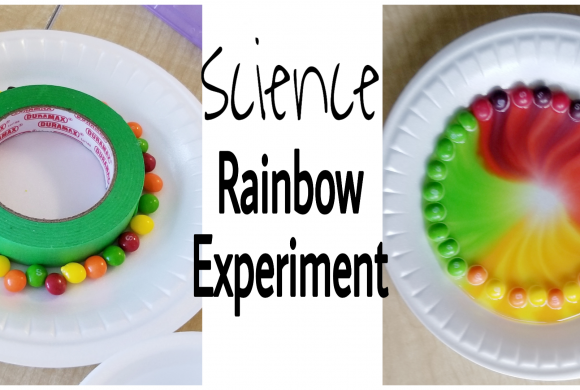 This colour mixing is an easy way to add another learning experience to this spring STEM activity.